Born September 4, 1982 in Clovis to the full name of Henry Randall Baskett III. He was the son of Henry Jr. and Judy. His father spent 30 years in the United States Air Force. He know is the director of a four-county program for abused children called the OASIS Children's Advocacy Center and also serves as part time Sociology professor at Clovis Community College. His mother has worked to become a Chief Financial Officer in her 35th year at Canon Air Force Base located in Clovis, New Mexico. His older brother Randy Curtis served in the Army and now is working as a defense contractor in Washington D.C. While at New Mexico he majored in General Management. Baskett enjoys to golf in his spare time and gives time to his charity the Oasis Children Advocacy Center. An imposing receiver with tremendous size and athletic ability, New Mexico alum Hank Baskett averaged 21.1 yards per catch during his rookie campaign with the Eagles in 2006. Originally a rookie free agent signee of the Vikings, Baskett was acquired by the Eagles in an off-season trade with Minnesota for WR Billy McMullen. CAREER HIGHLIGHTS: In 2006, became the 2nd rookie in NFL history to post 2 TD receptions of 85 yds-or-more (89 vs. Atl. 12/31/06 & 87 vs. Dal. 10/8/06) in a single season, since Green Bay's Billy Howton did so in 1952. Those two TDs were the two-longest by an undrafted rookie WR in NFL history, as he became the first Eagle ever to catch two TDs of 80-yards-or-more in the same season Working with hank since his rookie year it has been a pleasure. 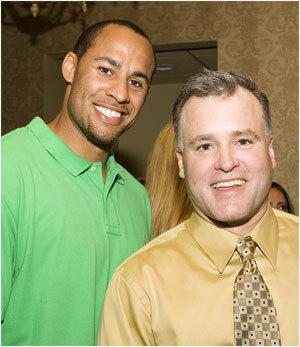 Hank Baskett is a first class gentleman and treats everybody like they should be treated. 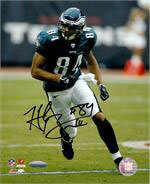 He is fan favorite and the up and coming star of the Philadelphia Eagles!